From Andor Polgar on YouTube, via matrixsynth. Rhodes, Make Noise Morphagene and cat, what is not to love? Things used in the video: vegan sausage for taming the cat (that’s her favorite), Make Noise Morphagene eurorack module, Rhodes Mark I electric piano, Expert Sleepers Disting mk4 for the reverb effect. Submitted by Ian Miles Becker via Twitter. Two classic instruments, Rhodes 73 electric piano and Prophet 600 synth. You can always follow us on Twitter @catsynth and share your own cat-and-music pics with us there. Submitted by Julian Dreißig on facebook. “Scales exercises for four paws. From suitandtieguy on an old thread on Muff Wiggler’s forum. Some of the photos have appeared here before, but some have not. I am pretty sure this is one that hasn’t. Can anyone identify the synths and other gear between the Rhodes and the cat? A few photos and thoughts from last Friday’s Reconnaissance Fly performance at Studio 1510 in Oakland. Click the above picture to enlarge it and spot the cat! Here we are getting ready to play the first note of our opening piece “Small Chinese Gong”. The set went well from that point. 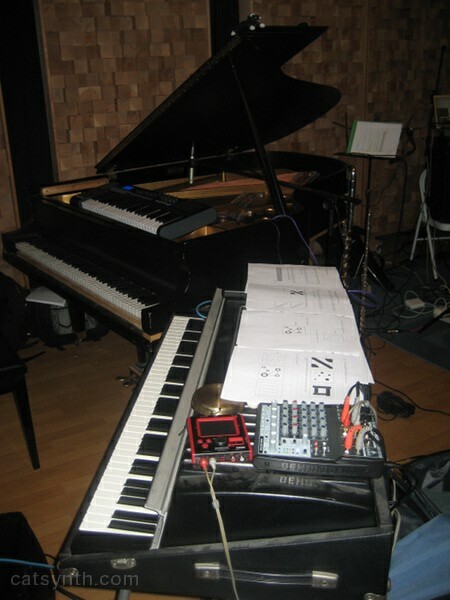 I have not yet heard the recording, but I thought the first piece, as well as “One Should Never” (which was about as tight as I have heard us play it), “Ode to Steengo” – with the interplay of the text, the Kaos Pad, odd drum beats and Tim’s live electronic processing – and “Emir Scamp Budge” went particularly well. Matt Davignon opened for us with a solo set featuring a live performance on drum machine and effects processors. This was nominally a performance marking the release of his new CD Living Things, although none of the pieces in the performance were actually from the CD. But that was OK. I particularly remember the last piece in the set for a variety of reasons, including but limited to the subtle effects in the music. Thanks to Scott Looney and Studio 1510 for hosting us! The Technos Acxel is an interesting synthesizer, based on manipulation of spectra in the frequency domain. This is something several of us have been doing in software for quite a while. In addition to the Acxel and the Rhodes Chroma, I see an E-MU EMAX in the background.